In Living a dream, Susanne Giesemann spins out a delightful story of many a cruiser’s dream. She and her husband Ty leave behind the “dream careers” for the “dream life.” Despite reaching the pinnacle of their careers in the Navy and experiencing political life on the world stage like few ever will, Suzanne and Ty distinguish between work and life and take the plunge, leaving behind all of the glamour for the liberating cruising lifestyle. Ironically, Suzanne had always wanted to go to sea but had to leave the Navy in order to do so. By the time the Navy admitted women to active duty aboard naval vessels, she was too advanced in rank to qualify for the shipboard track. Then 9/11 cemented the need to go to sea. After she and her colleagues witness the devastation at both New York and the Pentagon from the air, she and Ty make the decision to go for it and seek an adventurous life at sea. 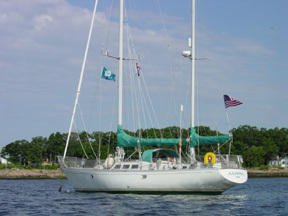 Retiring as soon as possible, they trade their coastal cruiser for a sturdy blue water vessel and move aboard to go sailing full time. Interestingly, no one believes them at first. People think that there is no way Suzanne in particular will be able to just walk away from having been the personal assistant to the Chairman of the Joint Chiefs. She traveled the world on diplomatic missions, managed daily schedules, organized and ran social functions, and ran her superior officer's life as well as her own. Suzanne and Ty decide to set out as co-captains but it soon becomes clear that she is much happier deferring to him when serious decisions needed to be made. I was surprised that she was not confident enough to execute on her own read of situations while she was at the helm - like the time she asked Ty what to do when she knew passing through a tight channel would clearly pose a hazard with a huge ferry about to pass through. Yet, it was quite refreshing and enlightening to hear about situations in which one or both of them behaved less than admirably or made questionable decisions. Most of all it was truly interesting to hear about experiences that were so similar to what my husband and I go through. I found myself thinking, "Wow, I can't believe we're not the only ones who do that!" Their adventures take them North first to the Canadian Maritime provinces. Their intention was to cruise Maine and Nova Scotia en route to Bras d'Or, then head south to the Caribbean before winter. They learned to navigate through pea soup fog, picking their way into sheltered harbors that few cruisers ever experience. Then someone told them to head north to Newfoundland . In true cruiser fashion, they buy some charts and keep heading north. Suzanne's description of the natives they meet (“Where ya from? Where ya headin’?) is quite entertaining, although most often there is little interaction with the local folks which creates a feeling of loneliness and isolation. Her description of the stark beauty of the landscape and the hardiness of the people makes you want to cast off tomorrow. On their way south, they make some surprising decisions, which we'll let you discover on your own. It's a delightfully written book that will leave you laughing and crying and yelling out loud, "No, don't do that!" It's a fast read and I thank Suzanne for her candor and congratulate her on her earnest pursuit of her dream.